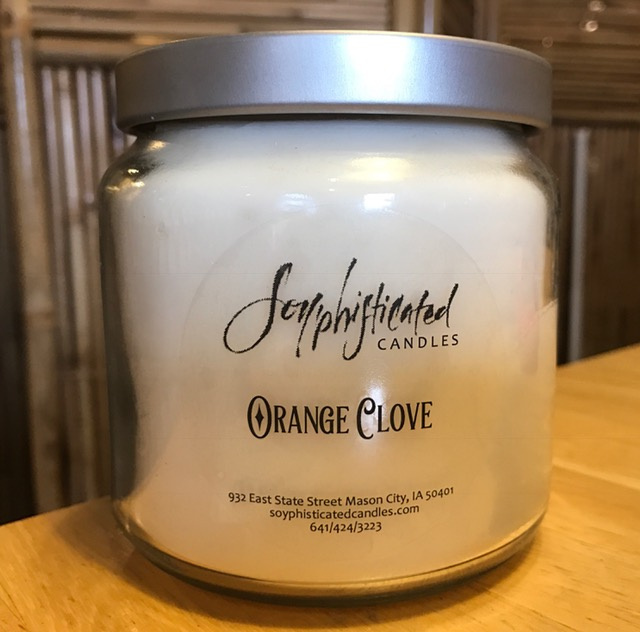 Soy candles by Soyphisticated Candles are made in Mason City, Iowa, with natural and renewable soy, cotton wicks, fine fragrance oils and essential oils. There is no paraffin or beeswax used in Soyphisticated Candles' soy candles. The sophisticated fragrances from our soy candles carry beautifully throughout your home- they are exotic and enticing. We use wonderful premium fragrance oils in our soy candles, as well as make true aromatherapy soy candles using 100% essential oils. You will find that our soy candles burn cleanly, with very little to no black, sooty buildup as some other types of candles leave. The design of our handmade Iowa soy candles, soy tealights and soy votives is clean and uncomplicated, to match any decor. Color is also available! 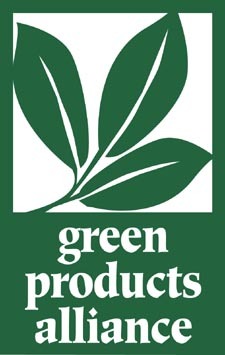 Our jars are made from at least 30% recycled glass, and are made in the USA! All sources for containers, wax, wicks and fragrances are also in the USA. Soy oil used in our handmade soy candles is renewable with each growing season, and is just one of the many uses of soybeans. Burning our soy candles is better for you, your family and home, and your environment. We use fine soy wax (refined and hydrogenated soy oil) made specifically for candlemaking, with no additives including beeswax. After processing, this wax contains no pesticide or herbicide residue, nor is it affected by genetic modification (which affects only the protein portion of the bean.) There are no commercially available organic soy waxes for soy candles on the market, so please do not be misled when shopping for soy candles. Would you like a completely 'green' candle? For pure candles made with essential oils, look at the Essential Oil Fragrances page for smashing scent choices using only 100% essential oils. Don't miss our handmade lotions made with true organic oils, cold-process handmade artisan soap and lip balm to care for your skin. We also wholesale soy candles! You will find Soyphisticated Candles' soy candles in shops and boutiques all across the United States, and in homes worldwide. If you have a favorite place to shop, let them know about Soyphisticated Candles! Beside the Prairie Playground and East Park. Another local location to purchase Soyphisticated Candles is MacNider Art Museum in Mason City. For local customers- REDUCE, REUSE, RECYCLE AND REFILL! Bring in your empty candle containers (clean, of course) for a refill at a discounted rate. We buy less containers, less fuel is used for shipping, you save- we save- the world saves. 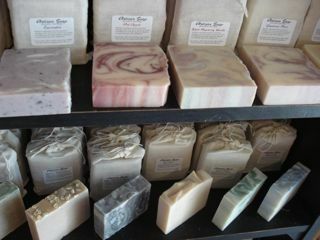 Please check out our fantastic laundry soap! Made with no added surfactants or detergents, it leaves your clothes clean and smelling clean, not perfumey or fragranced, and rinses completely from your clothes. A two-pound bag will wash 64 loads in a high-efficiency washer. BE GREEN! For long-distance customers (and there are LOTS of you), RECYCLE LOCALLY! The world needs more green! Reuse your jars and tins for fun things. Bring your CLEAN jars in for refills! ***We have been asked many times if we will make custom wedding soy candles. Of course! Soy pillar unity candles, floaters, soy votives, scented candles, soy tealights, unscented, natural or in COLOR. Color matching is a specialty. Just email or call, and we will be happy to help you.